DEXE Hair Building Fibers is an increasingly popular beauty product for a fuller and more natural looking hair with millions satisfied customers worldwide. As soon as you apply the DEXE microfibers, you will have fuller hair as if your hair has never been sparse. You’ll see for yourself once you try it. This product is only sprinkled on the sparse hair and it simply merges with your hair, leaving it totally thick and natural. Thanks to the electrostatic effect, microfibers are well fixed to the hair, so that no wind nor rain can remove it. Finally there is a safe and natural way to eliminate the phenomenon of hair loss in men and women. It’s not a spray, cream or something that only covers the hair. In fact, this is a new and revolutionary product so advanced it can not be compared to anything you have seen before. 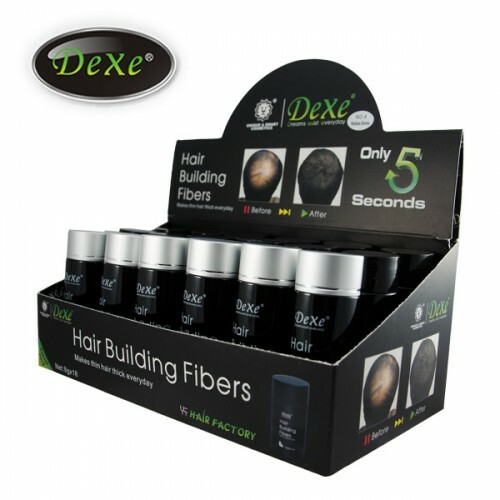 DEXE fibers are a new, extraordinary complex of invisible “microfibers” that will fit perfectly with your hair. DEXE microfibers are made from the same organic protein - keratin just like your own hair. Through the process of adhesion, these fibers are being restructured on your hair, making it thick and strong. That’s how you will immediately get a fuller and more natural look you never could have imagined. DEXE is a quick and a safe way to improve the appearance of hair. It momentarily conceals flaps, thinning and graying hair, and also the growing hair and makes it thick and lush after application. The product is completely unnoticeable even from a close range. It is resistant to wind, rain and sweat. Thanks to its natural composition it is suitable for everyone and does not cause any allergies. When you use DEXE to treat head portions that are completely free of hair, or where the hair is sparse, the negatively charged fibers are attached to the positively charged hair shafts like a magnet due to the static electricity. DEXE is a 100% natural product. It consists of plant fibers that are dyed with natural mineral pigments in all shades of hair. It is an antiallergic product and it can also be used for sensitive skin. DEXE fibers are made of plant fibers. Their optical structure is very similar to natural hair. This is one of the reasons why DEXE gives a completely natural effect. It contains no synthetic colors or preservatives. It can be used in combination with other hair products, including products for medical treatment of hair and scalp. DEXE can be used after hair transplant surgery to increase the exuberance.